• Acute keratoconus with keratometry > 70 D.
• Corneal remodeling through addition of tissue: Preserves corneal integrity. • Topographic regularization and refractive correction, conserving the natural prolate shape: Reduces optical aberrations, improves visual acuity and tolerance of contact lenses. • Stabilization of corneal ectasia: delays cornea transplants indefinitely. Keraring is available in 2 models (SI-5 and SI-6) for implantation in 5.0, 5.5 and 6.0 mm optical zones, depending on the preference of the surgeon and the requirements of each case. Keraring offers 40 different thickness, arc length and diameter options, allowing for greater customization of corneal remodeling and refractive correction. incidence of glare and halos. 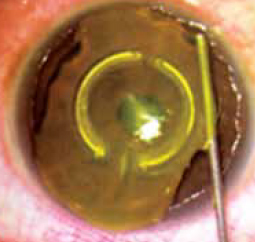 Keraring can be removed at any time, allowing the cornea to return to its original characteristics. The procedure is reversible. 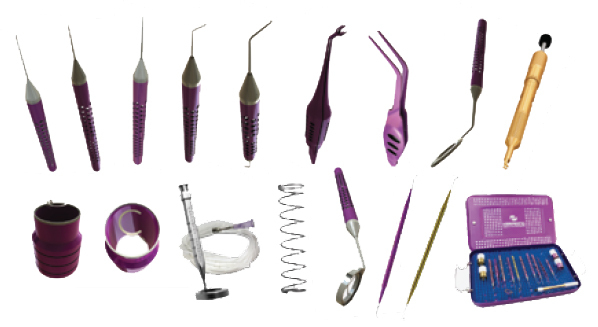 Refractional and topographic effects can be easily readjusted by replacing and/or repositioning the implant. The Keraring implant allows synergistic combination with techniques such as collagen cross-linking, PRK and phakic IOL implants. Keraring patients enjoy high levels of satisfaction with major positive effects on their quality of life. As it is a minimally invasive technique, it allows the patient to quickly resume their normal activities. Topographic and refraction alterations start in an average of three months. The Keraring implant is a procedure that is easy to learn and execute. It is performed using topical anesthetic under an outpatient regime. The surgical instrument was designed specifically for the manual dissection and femtosecond laser dissection techniques. Prior to implanting Keraring, surgeons must take part in one of the accreditation courses offered by Mediphacos and its distributors. Request an up-to-date course schedule or personalized training at your own clinic. Correctly selecting the Keraring size and position for each case is of great importance for the result. Based on the statistical analysis of thousands of results, Mediphacos periodically updates its implant calculation nomograms and offers permanent high quality technical advice and consultancy services.